On the third day of the 34th Kagyu Mönlam, His Holiness the Karmapa joined the Mönlam Members’ lunch, which is set out every day at the Mahayana Hotel for the duration of the event. Long before the arrival of the Karmapa, the Members had already been queuing patiently in a long line that stretched from the lobby all the way across the forecourt of the hotel to the street outside, waiting for their turn in the dining room. The Members were, of course, thrown into a flurry of excitement, hurriedly reaching for katas, as the news of the Karmapa’s impending visit spread. As the wait went on, they spontaneously broke into chanting Karmapa Khyenno. And not long after, they were indeed heard, as the queue moved aside and the Karmapa’s car rolled in. His Holiness went directly to the dining room where a table had been prepared for him, and the early-bird Members were waiting with more chants of Karmapa Khyenno. His Holiness briefly went up to check the buffet, then resumed his seat as a laden tray made its way to him. 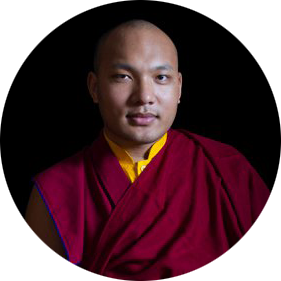 As the Karmapa took out his chopsticks and mindfully sampled the meal, Members were torn between their need to get their own food – especially those trying to keep to the strictures of their Sojong vows – and their admiration of the Karmapa sitting in their midst. For many, hunger won out, and as piled plates went past and new entrants gained the dining room, excited giggles broke out as they realised whose presence they had walked in to. 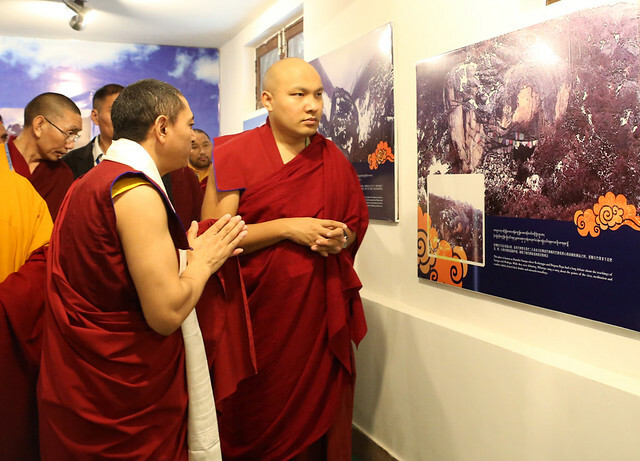 The Karmapa didn’t stay long, though, and quickly moved on to visit the Milarepa exhibition, also being held at the Mahayana Hotel until the end of the Mönlam. 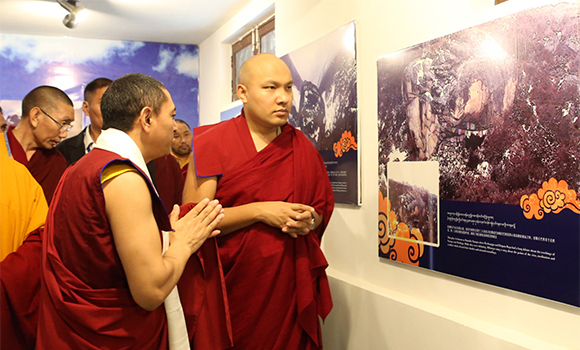 The exhibition centered on photographs of the most significant places in Tibet and Nepal connected with episodes in the lives of Milarepa and his disciples. Most of the photographs were taken directly by Lama Dawa, the organiser of the exhibition, over a period of three years. For some of the photographs of Nepal, he relied on the help of a local monastery, as the uncertain situation in the country prevented access to the sites by outsiders. Among the most spectacular were surely the Fortress of the Central Channel, on the site where Milarepa practised on a diet of nettles; the Lotus Cave on the western side of Mount Kailash; and Lapshi Snow Mountain, prophesied by Marpa as a sacred site for Milarepa. As Tibetans crammed along the corridor waiting for a view of the Karmapa, Lama Dawa escorted him along giving a commentary on the exhibition. Having reached the end of the main gallery of photographs, His Holiness returned to where a table was set with tea and biscuits, and had a chance to look at some exhibits in more detail. He also took in the central room of the exhibition, where photographs were complemented with thangkas, statues, precious manuscripts and relics of Marpa and Milarepa. On his way out, the Karmapa took the time to greet and talk to the waiting Tibetans. Then the sirens were on, the car rolled away, and only the queue of the Members still waiting for lunch remained.